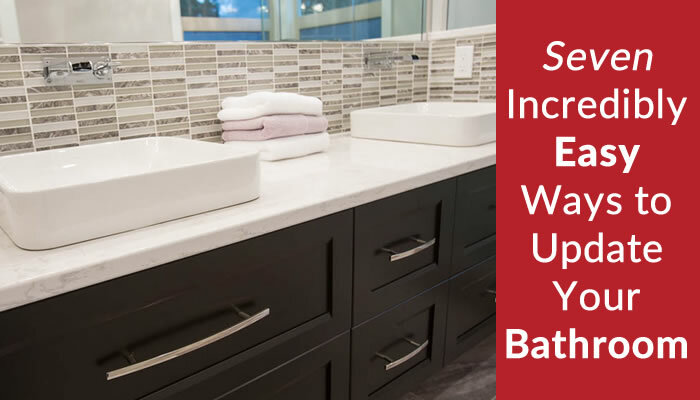 Remodelling your bathroom doesn’t have to mean a complete overhaul and a hefty price tag. There are many ways to tackle this room to make it more appealing and functional. If your budget is somewhat limited, but you have a vision of a sparkly new space, here are 7 easy ways to update your bathroom. First in order is to clean, clean, clean. You would be surprised how a little elbow grease can bring the life back to this most used room. Grout: The grout between the tiles is often neglected and over time can build up soap scum. It’s easy to clean with a bit of abrasive cleaner and a small brush. Once done, reseal with grout sealer. Ceiling Fan: Get up on the ladder and clean the bathroom fan. This device clears the steam and moisture from your bathroom. Over time, dust accumulates in the vent and fan, limiting the air circulation. Simply remove the fan cover, rinse under water and dry. Then take a dry paint brush and dust out the fan blade. (Make sure the fan is OFF!) Replace the fan cover. Done! Walls: Wash down the walls, door and trim. Then determine if a fresh coat of paint is in order. Give the walls, ceiling, door, trim and even the vanity a fresh coat of paint. The best paint for the walls and ceiling in this room is an anti-mildew paint (often referred to as Kitchen & Bath). For the door, trim and vanity a waterborne alkyd will do the trick. Select a soft neutral colour for the walls, and white for the door and trim to create a spa-like experience. If your vanity cabinet is in good shape and you like how it functions, how about changing out the door and drawer fronts? This is an inexpensive but very easy way to change the look of your bathroom. There are hundreds of styles to choose from, in any colour you desire. Add some new pulls or knobs and you have a brand new vanity. Frame out your mirror (if it doesn’t have a frame). You can achieve this buy gluing basic moulding around the mirror, then painting it to match the vanity. If your tub and tile surround are in good condition, but the colour just does not fit in with your style anymore, consider having them re-glazed. This is a very economical way to change the look of the space. Instead of investing thousands to tear out the existing tub and tile and replacing with new, this option will cost between $500 – $1000 depending on the size of the tub and the amount of tile. There are several options for the countertop. Laminate is of course the least expensive option, and the colours and patterns are virtually limitless. 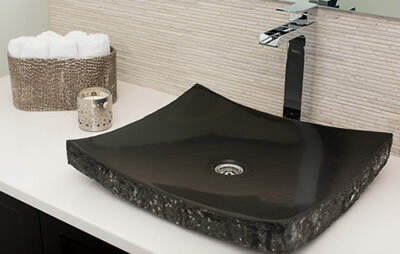 However, you are restricted to a drop-in or vessel sink, as undermount sinks can only be used with solid-surface countertops. Quartz or natural stone (solid surface) are more costly. Get rid of that old 5-bulb bar light. Maybe it’s time to install something new and different. Consider LED pot lights on the ceiling for a clean, modern look. An updated vanity light or small pendant lights over the sink will finish off the aesthetic in your new bathroom. Update your fixtures for a fresh new look. It may be difficult to change out the tub and shower fixtures without getting behind the tiles, but, you can change up the shower head to one that is multi function. There are many makes and models on the market that are a combination rain shower and hand held. Consider how you want your bathroom vanity to function. In a larger, main bathroom that is used by many people you will require as much storage as possible. A vanity with drawers will give you more usable space than one with doors. Drawers are easier to keep organized and items are much more accessible. In a powder room with minimal space, a small cabinet with doors will suffice, or consider a pedestal sink and install a shelf or two on the wall above the toilet to store extra rolls of tissue and hand towels. Hopefully this gives you some great budget-friendly ideas for updating your bathroom. Whether you want to freshen up your space by using some of the tricks above or do a full renovation, contact me if you live in the North Vancouver, BC area to help you untap your home’s hidden potential. I can also help you choose fixtures, bathroom vanities, lighting and more that complement your style and space.